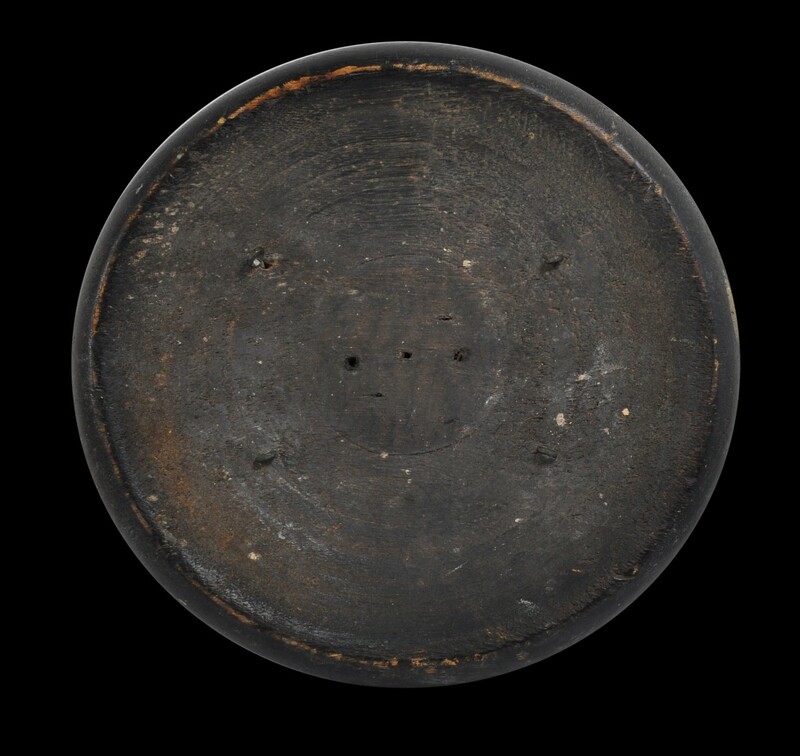 This parrying shield or buckler has been carved from light wood. It is decorated with 19 cast and engraved brass six-pointed stars of varying size, each with a central dome. The outer edge is decorated with brass wire arrayed in repeated triangles. The surface of the wood has also been coated in a dark paint. Four small rings attached to the concave reverse would have allowed rope or tape to be pulled through so that the shield could be worn over the forearm. 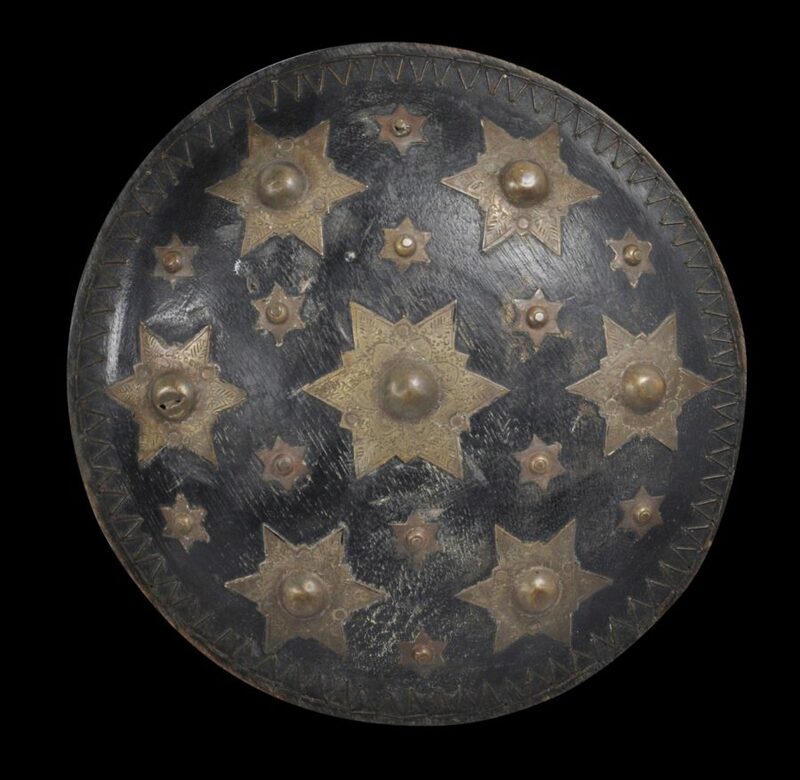 Shields or bucklers such as this example were made by the matrilineal Minangkabau people of west Sumatra for export to the Aceh sultanate in northern Sumatra. The Acehnese used bucklers of this dimension for a type of sword dance that no longer is performed. 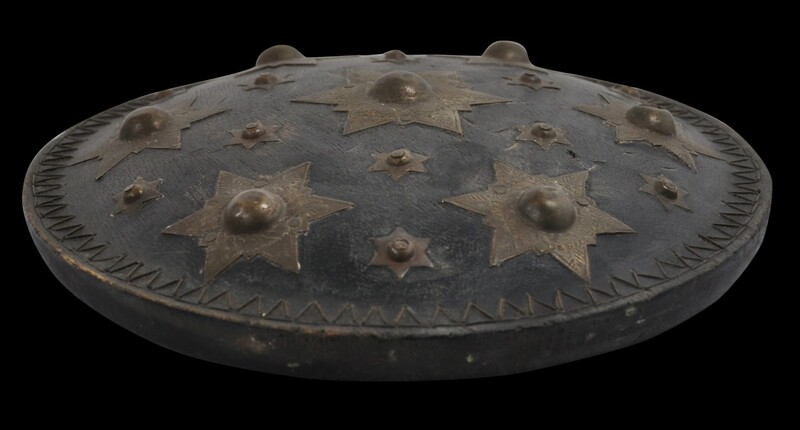 Such bucklers also were exported to the Batak people of northern Sumatra. Minangakabu bucklers come in a wide variety of media and types. Related examples are illustrated in Singh (1985, p. 41), Jasper & Pirngadie (1930, 144), and Van Zonneveld (2001, p. 106). The buckler here has a fine patina and obvious age. Jasper, J.E. & Pirngadie, De Inlandsche Kunstnijverheid in Nederlandsch Indie V: de Bewerking van Niet-Edele Metalen, 1930 (reprinted 2009 by Sidestone Press, Leiden). Singh, B., Malay Brassware: A Guide to the Collections, National Museum of Singapore, 1985.